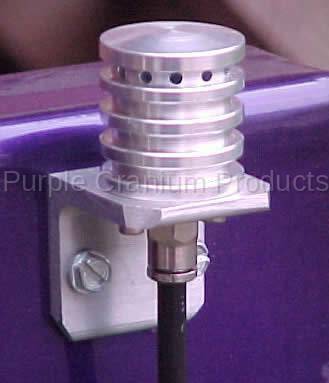 Remote Mounted Diff Cleaner - Billet Aluminum - Cleaner body is machined from a solid piece billet 6061-T6 aluminum. Filter element is made of a self-cleaning polyproplene and keeps debris from entering the differential. Remote billet aluminum mounting bracket attaches high to your vehicle frame to keep water and debris out of your differential case when axle are submerged. Includes mounting bracket, nickel plated water tight push fittings, filter, 4' poly hose, stainless steel/zinc plated mounting hardware and instructions. Please specify the color of poly hose you will require. Blue, red, yellow, black or green in the comment section at check out. The last thing you want in your axle is dirt and water. Since axle(s) have the least maintained fluid in any vehicle, you would never know the fluid was contaminated until it’s too late. Purchase some cheap preventive maintenance now.